Bonsai is a very refined and precise art form. 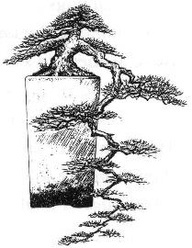 As such, each bonsai must conform to a clearly defined style. There are many officially recognized styles, but there are five main ones that every enthusiast should be familiar with; these are cascade, formal upright, informal upright, semi-cascade, and slanting. It is often easiest to start working on a tree keeping in mind what style it will embody, however not choosing a style right away will not take away from your enjoyment of the art. This style requires the tree to grow in a perfectly straight line upwards with a vertical taper where the base is visibly wider than the top. 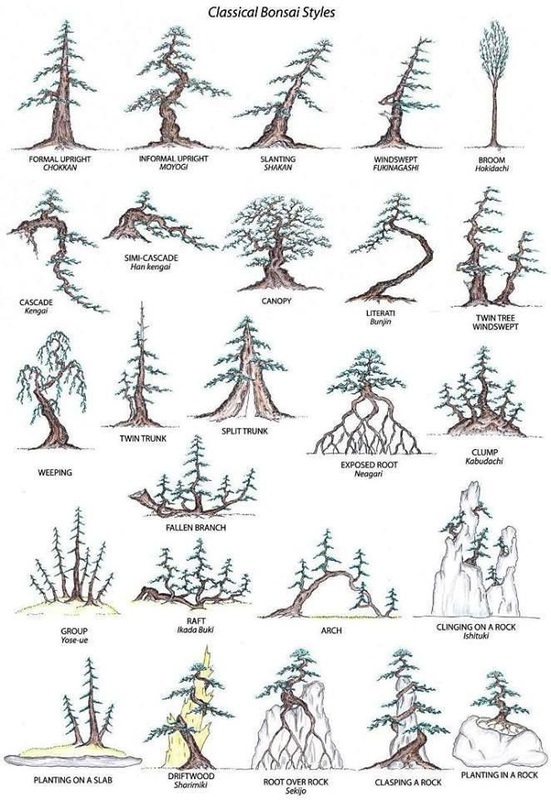 There should also be a visible nebari to complete the visual effect of a tree in nature that grows in open flat ground, without competition from other trees, and protected from strong winds. This style represents maturity, perfection, and and timeless quality. Informal upright trees grow straight up but with delicate curves in the trunk (usually two or three). The first curve starts at the trunk which tilts at an angle. The remaining curves are spread out throughout the rest of the trunk. This is an ideal style for beginners. Trees well suited for the style include most species of trees, but specifically deciduous trees, flowering trees, maples, elms, and quince. Cascade style represents a tree growing on a cliff with branches flowing down (cascading) past the base of the tree. 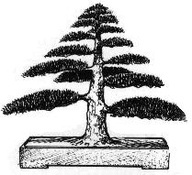 This style requires the tree to be grown in a pot that is placed on an elevated stand since the tree's branches extend past the base of the container. 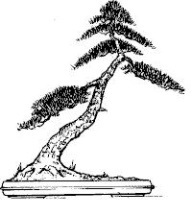 This style can be successfully achieved with junipers, yews, pines and other confer bonsai. This style takes a lot of patience and dedication as the tree will naturally try to grow upwards. This style is similar to the cascade style. The difference is that the descending tree trunk doesn’t normally go any lower than the base of the pot allowing the tree to be displayed on a flat table instead of a tall stand. This style symbolizes trees that grow over flowing water and rivers where the branches almost touch the water. 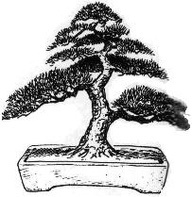 This style can be used for most trees, but works best with junipers, yews, pines and other conifer bonsai. Slanting style trees have trunks that slant dramatically to one side as if the tree was forced sideways by some natural phenomenon like strong wind, landslide, or knocked over by a fallen larger tree. This style has branches on both sides of the trunk. This is important to note, because this style is similar to Windswept, which features all the branches on one side.